Electrostatic painting is based on the basic law of electricity; opposites attract. The item to be painted is given a positive charge. The paint is given a negative charge and atomized through a special revolving nozzle on the spray gun. Once the paint is sprayed it is immediately attracted to the item, much like a magnet attracts iron fillings. The end effect of this amazingly neat and clean process is a smooth, even coat with never any overspray, fogging or drift. Our wide color selection of durable epoxy paints resists peeling, chipping and discoloration and endows furnishings with a beautiful semi-gloss luster. The process is so precise and clean that file cabinets and desks do not have to be emptied. And most importantly, the office is ready to be used the very next day! 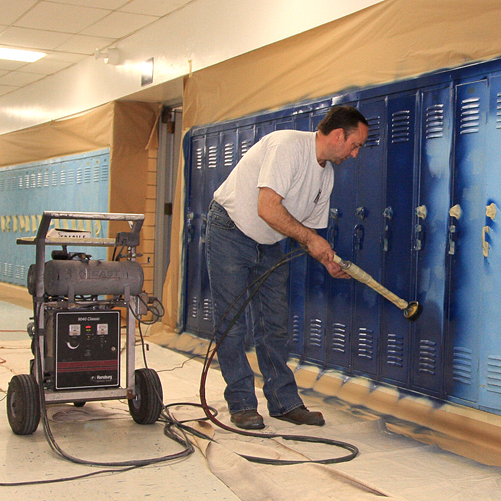 A key benefit of electrostatic painting is that there are no office interruptions. Monarch renovation crews work nights, weekends, and holidays at no extra charge. We strive to serve you at your greatest convenience and will work with you to create a flexible renovation plan that easily accommodates your unique operating schedule.